Subfloor securing... I know there is lots of different opinions and ideas about this. So this is how I skinned the cat if you will, or if you're a fan of Letterkenny this is how I F**Ked that pig. 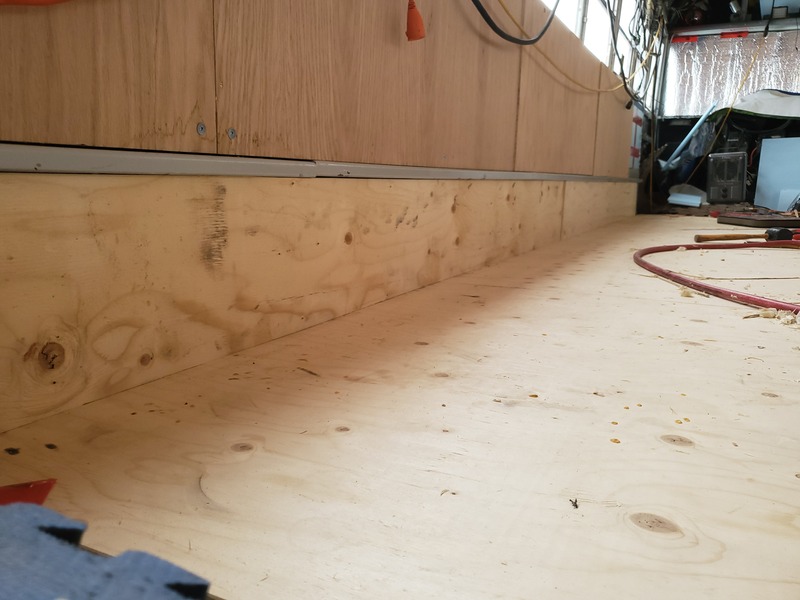 So one of the most common problems with plywood is the cupping, bowing, or twisting... less so with T&G but still an issue end to end on length. Now my subflooring composition is as follows, treated steel floor, epoxy painted (fancy aircraft paint..) 1" rigid foam board, and 5/8" T&G. Now in between the steel and the foam board I spray a bunch of foam friendly spray glue, and set it in place, along the edge gap from the foam to the wall. I put PL300. 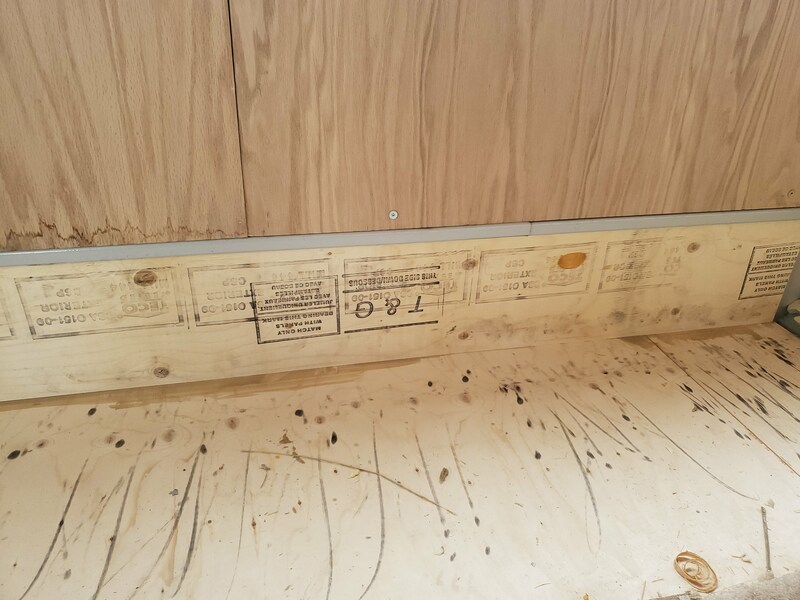 I immediately put more spray glue atop the foam and laid my ply on so the that the cupping would be up, this meant the boards would be making good contact across the middle. I placed all my tools, wood, and HD rubber floor tiles (400# worth) along the edges of the floor. I did this for a couple reasons, firstly my hallway will run down the middle of the bus, therefore all my furniture and storage will be to the outside, this means I will have stuff holding down the part of the floor that has a natural tendency to lift. But secondly I intended to skin the lower part of the wall for ease of fastening short cable runs, water lines, etc. this permitted me to use my lower wall skin as a jam or pressure wedge. then pushed my wall skins in and tapped them home with my dead blow mallet and 3# mallet. After that I zipped them in with my short tek screws, this should....in theory...... prevent any squeaking due flexing of the frame over rougher roads. 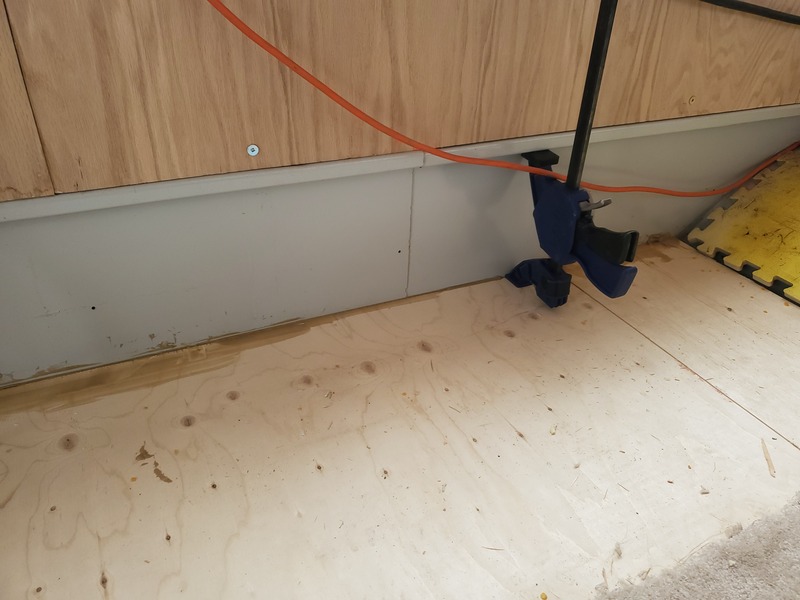 Once I clean the floor and get ready for my hardwood install I will seal the edges of the plywood, this way if I end up with any sort of internal water spillage. it wont get below my floor. I intend to have internal fresh water. Rated Cap: Blue-Bird says 72 pass. @Yukon Cornelius, that's looking very good. What will you seal the edges of the plywood with? Out of curiosity...how tall are you? The interior height of your rig? And what's your intended sub ply thickness and finish flooring? Going to be a warm floor with 3" joists and insulation, but at a serious cost to the headroom. Not trying to poke holes (see what I did there ) I just like to understand where people are coming from and what their intended goal is. I'm 6' and the ceiling is like 6'5" down the center. I'm (maybe) going to do a weird "sunken" floor section around the wheel wells where the sheet metal will be on the bottom (resting on the chassis rails) and then the 3" joists will be on top of this. So with 3/4" ply and vinyl sheeting I'll only be about an inch above the original (metal) factory floor, in this section at least. For the rest I'm going to have a skylight that will extend the headspace forward to the front exit hatch, and the rear exit hatch will extend it backwards, so other than a short area in the front and the bed in the back, I'll be able to stand upright the length of the bus (without doing a roof raise). I'm only doing the sunken floor thing because the floor around the wheel wells is severely rusted and I need to replace it anyway. It would not be terribly sane to do this with a healthy floor section (probably not terribly sane as it is). @musigenesis, My stock ceiling is the same height as I am without shoes. Your skylight idea sounds interesting, but quite possibly a lot easier said than done. I would really like to hear more. I hope skylights aren't easier said than done, but I dunno. I was planning on something like this: https://www.icondirect.com/rv-skylight-sl2649/ To make an opening for this I would only need to cut a 30" section out of one hat channel and then weld a couple of transverse supports between the two adjacent panels, then screw this skylight in and sealantify the edges (it won't be openable, just there for light and to fit my head in). This skylight would be half over my sunken floor and half over the adjacent non-sunken part (there'll be a 3" step-up here) and would allow me to step up without banging my head into the ceiling. I'm honestly not sure how to deal with the curvature of the roof, since I don't think this particular skylight can bend, so the attachment frame would have to be built up and leveled in some way. I'm also thinking I might just use a piece of Lexan glass and have it flush with the roof - this would still give me sufficient headroom to stand up (because of the cut channel) and could obviously curve with the roof. I know you've probably already considered this, but why not just do a small roof raise? Say- 6 inches... It really opens it up in there. My roof raise budget is basically going towards rebuilding the floor, which was an unanticipated expense. But if the rebuilt floor gives me adequate headroom (and I had only been planning a partial roof raise anyway) then it's a net gain since I think the floor will cost me less than $2000. As my grandpappy used to say, "when Life gives you lemons, jam them up Life's tailpipe." FWIW there really isn't a lot of cost involved in raising a roof if you do it yourself. Read through "roll your own". I got my materials free but even if I'd bought them it would have been maybe $500. Not trying to be pushy or anything... But raising a roof is nowhere near as hard as it seems and frankly its shocking what folks charge to do one. THe less you raise the easier it is to get good looking results. Either way- make that lemonade man... I always use the old saying "you have to crack a few eggs to make an omelette." I think most 1/2 sheathing made in Canada after the mid-70s is four ply. I was working in Prince George then and we started making a lot of of 4 and 6 ply around 1976 or 77. I'm convinced that the 5 and 7 ply that got replaced were stronger, and less likely to delaminate. And I also think you are 100% correct about Canadian glue being more water resistant. With skylights that long you will have ribs showing in the middle, or how are you dressing the ribs in the skylight.